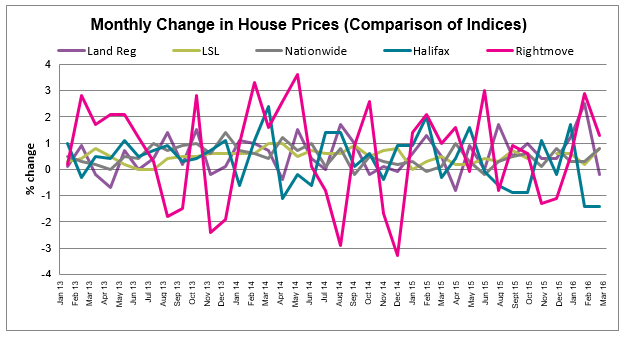 The start of 2016 began with increased market activity and a rapid rise in house prices. Activity has remained strong through Q1 2016 with UK home sales up 5.5% between January and February and up 16.1% year on year (seasonally adjusted HMRC). 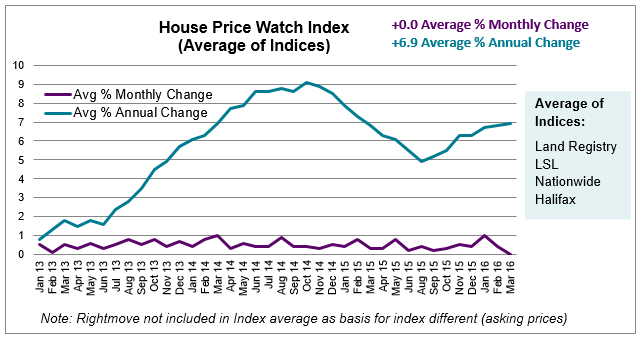 However, we are beginning to see house prices settle down with UK average house prices stable over the past month and annual house price growth up slightly to 6.9% in this month’s House Price Watch (average of indices). It is expected that stamp duty changes on second homes coming into effect in April have brought forward transactions from those wanting to avoid additional tax liabilities. Looking forward, a slower property market is anticipated. The upcoming stamp duty changes on second homes are expected to take the heat out of the investor market and uncertainty around the EU referendum and the impact of Brexit could also slow activity. Regionally, we can see that the surge in house prices in London has begun to temper. 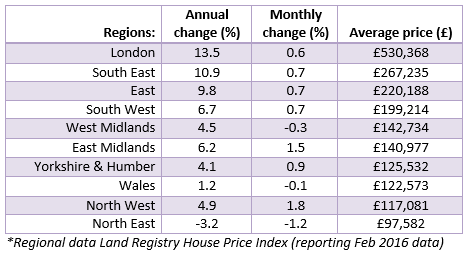 A number of regions have experienced a deceleration in house prices in the past month with prices down in the North East (-1.2%), West Midlands (-0.3%) and Wales (-0.15). The North West (1,8%) and the East Midlands (1.5%) have seen the biggest monthly rises in house prices.